On 13 April 2018, France, the United Kingdom, and the United States took action to strike the Syrian chemical weapons infrastructure. The bombardment, a coordinated effort involving both Britain and France, began at 9 PM Eastern Daylight Time (Washington time) Friday [4:00 am 14 April 2018 Syrian time, shortly before dawn prayers] and rained down more than 100 cruise missiles on Syrian facilities in the capital, Damascus, and the city of Homs. Late on 06 April 2017, starting around 8:40PM Easter Time (4:40 a.m., April 7, in Syria), the United States military launched 59 Tomahawk Land Attack Missiles (TLAMs) at the Shayrat Airfield in Syria's Homs governorate. Targets struck included the airfield's aircraft, hardened aircraft shelters, petroleum and logistical storage, ammunition supply bunkers, air defense systems, and radars. The missiles were launched from U.S. Navy destroyers (USS Ross (DDG 71) and USS Porter (DDG 78)) located in the eastern Mediterranean. The strike came in retaliation for a chemical attack on April 4 in Khan Sheikhoun which killed scores of civilians earlier. According to the DoD, Shayrat Airfield had been used to store chemical weapons and Syrian air forces. The U.S. intelligence community assessed that aircraft from Shayrat conducted the chemical weapons attack on April 4. The strike was intended to deter the regime from using chemical weapons again. Russian forces were notified in advance of the strike using the established deconfliction line. From the 1991 Persian Gulf War to late 2001, the US fired about 1,100 Tomahawks, including up to 70 against Taliban and al-Qaeda targets in Afghanistan. Tomahawk was used extensively during Desert Storm in 1991, in Iraq in January and June 1993, in Bosnia (Deliberate Force) in 1995 and in Iraq (Desert Strike) in 1996. Four hundred Block II and Block III missiles were fired on five separate occasions. Two submarines and a number of surface ships fired Tomahawk cruise missiles during the Gulf War. According to initial US Navy reports, of 297 attempted cruise missile launches, 290 missiles fired and 242 Tomahawks hit their targets. The speed, stealth, endurance and firepower of today's nuclear submarines were demonstrated in 1991 during America's participation in Operation Desert Shield and Operation Desert Storm. Used primarily as surveillance platforms, USS Chicago and USS Louisville operated in conjunction with Allied Naval Forces in the Red Sea. On January 19, 1991, USS Louisville made the transition from passive surveillance to active combatant, becoming the first submarine in history to launch a Tomahawk cruise missile against an enemy target. But TLAM performance in Desert Storm was well below the impression conveyed in DOD's report to the Congress, as well as in internal DOD estimates. During Desert Storm, a TLAM mission was loaded 307 times into a particular missile for launch from a Navy ship or submarine. Of those 307, 19 experienced prelaunch problems. Ten of the 19 problems were only temporary, thus these missile were either launched at a later time or returned to inventory. Of the 288 actual launches, 6 suffered boost failures and did not transition to cruise. Despite initial strong positive claims made for TLAM performance in Desert Storm, analysis of TLAM effectiveness was complicated by problematic bomb damage assessment data. The relatively flat, featureless, desert terrain in the theater made it difficult for the Defense Mapping Agency to produce usable TERCOM ingress routes, and TLAM demonstrated limitations in range, mission planning, lethality, and effectiveness against hard targets and targets capable of mobility. According to President Clinton, he ordered some 23 Tomahawk missiles to be fired into Iraq to send a message to the government of Iraq and other terrorists. 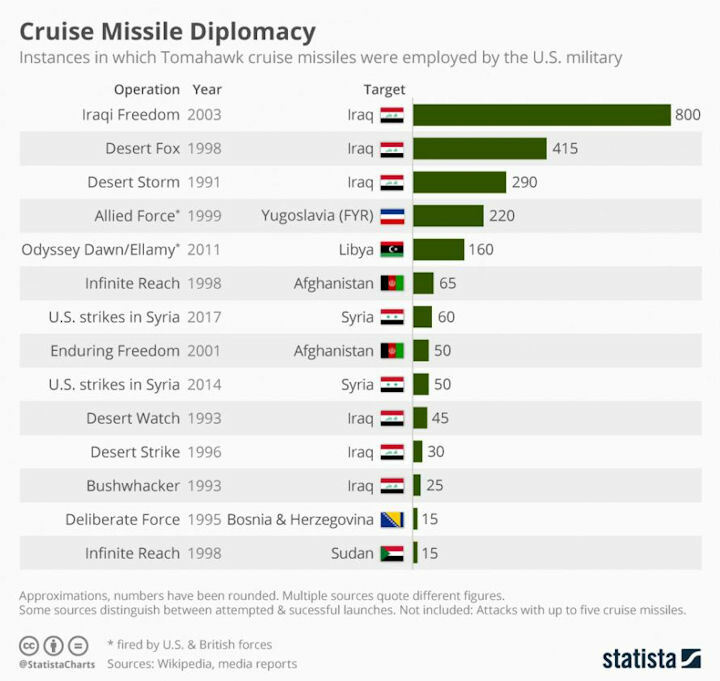 "On June 26, 1993, at my direction, U.S. naval forces launched a Tomahawk cruise missile strike on the Iraqi Intelligence Service's (IIS) principal command and control complex in Baghdad. This facility is the headquarters for the IIS, which planned the failed attempt to assassinate former President Bush during his visit to Kuwait in April 1993." The Gulf War and subsequent contingency operations, including the September 1996 attacks on Iraqi military installations, demonstrated that long-range missiles can carry out some of the missions of strike aircraft while they reduce the risk of pilot losses and aircraft attrition. Although the number of ships (including attack submarines) capable of firing the Tomahawk grew only slightly--from 112 to 119--between 1991 and 1996, the Navy's overall ability to fire these land-attack missiles has grown considerably. This is because a greater number of the ships capable of firing the missile are now surface ships and surface ships are able to carry more Tomahawks than submarines. As of the beginning of 1996 the US Navy had 140 Tomahawk-capable ships with 6,266 launchers), of which there are 72 SSN's (696 launchers) and 70 surface ships (5,570 launchers). There were over 4,000 Tomahawk cruise missiles in the inventory in 1996. Block III, with its improved accuracy and stand alone GPS guidance capability, was first used in the September 1995 Bosnia strike (Deliberate Force) and again in the September 1996 Iraq strike (Desert Strike). Success rates for both strikes were above 90%. In all, Tomahawks firing power showed a greater than 85% success rate. Submarine operations went from routine patrols to aggressive strike on August 20, 1998. Submarine and surface ships of the USS Abraham Lincoln Battle Group launched Tomahawk cruise missiles against Sudan and terrorist training camps in Afghanistan 13 days after terrorists bombed the U.S. embassies in Kenya and Tanzania. On Aug. 20, President Clinton launched Operation Infinite Reach. US attack submarines fired Tomahawk Land-Attack Missiles at two targets linked to bin Laden's terror network - a training camp in Afghanistan 60 miles south of Kabul and the Shifa pharmaceutical plant in Khartoum, Sudan. The Shifa plant was believed to produce a precursor to the chemical weapon agent VX. As justification, the Chairman of the Joint Chiefs of Staff, Gen. Henry H. Shelton, said, "Osama bin Laden's network of terrorists was involved in the planning, the financing, and the execution of the attacks on the US embassies." After the Aug. 7 bombings of U.S. embassies in Kenya and Tanzania, the U.S. launched more than 75 Tomahawk land-attack missiles from ships and submarines against terrorist targets in Afghanistan and Sudan. Then on December 16, 1998, USS Columbus (as part of the USS Carl Vinson Battle Group) participated in cruise missile attacks against military targets in Iraq in Operation Desert Fox. On December 16, 1998, United States Central Command (USCENTCOM) military forces launched cruise missile attacks against military targets in Iraq. These strikes were ordered by the President of the United States and were undertaken in response to Iraq's continued failure to comply with United Nations Security Council resolutions as well as their interference with United Nations Special Commission (UNSCOM) inspectors. Operation Allied Force, in the spring of 1999, occurred when inventory levels of Tomahawk missiles were at critical levels due to previous combat expenditures of 811 missiles prior to 1999. Navy Tomahawk land attack missiles played a critical role in the 1999 Kosovo air campaign. Used selectively throughout, they were sent to destroy over 50 percent of key headquarters and electrical power station targets. Launched from the sea to shape the battle inland, Navy Tomahawks achieved a 90-percent success rate against these vital targets in all-weather conditions. All TLAMs expended during Operation Allied Force were the Block III configuration. Tomahawk missiles utilize a solid propellant rocket motor to accelerate the missile through the initial boost phase of flight until the turbofan engine takes over for the cruise and terminal phases. Two versions of TLAM were used in this operation. The TLAM-C has a conventional unitary warhead, while the TLAM-D carries conventional submunitions. TLAMs were continuously present in the theater, and could be used to execute timely attack. This gave the joint force commander the ability to utilize the principles of surprise, initiative, and massed firepower on key enemy targets. Six ships and three submarines from two U.S. Navy battle groups and one UK submarine launched 218 missiles in preplanned and quick-reaction strikes. Target types ranged from traditional headquarter buildings and other infrastructure targets to relocatable targets such as aircraft and surface-to-air missile launchers. Tomahawk was often a weapon of choice for targets with the potential for high collateral damage, and was used to attack numerous targets in Belgrade. In response to the terrorist attacks of 11 September 2001 against the World Trade Center and the Pentagon, the United States initiated military actions in afghanistan by means of operation Enduring Freedom (OEF). Early operations used land-based B-1, B-2, and B-52 bombers; carrier-based F-14 and F/A-18 fighters, and Tomahawk cruise missiles launched into Afghanistan from both U.S. and British ships and submarines. Gen. Richard B. Myers, the JCS Chairman, announced the action at an Oct. 7 DOD news briefing. He said, "About 15 landbased bombers, some 25 strike aircraft from carriers, and US and British ships and submarines launching approximately 50 Tomahawk missiles have struck terrorist targets in Afghanistan." USS PHILIPPINE SEA (CG 58) participated in Operation Enduring Freedom by launching the first wave of Tomahawk Missiles into Afghanistan. Following the September 11, 2001 terrorist attacks, USS Key West was within the Fifth Fleet Operating Area and was the first ship to arrive off the coast of Pakistan, firing Tomahawk cruise missiles into Afghanistan in support of Operation Enduring Freedom. When Operation Iraqi Freedom commenced in March 2003, USS Cheyenne became the first U.S. warship to fire Tomahawk cruise missiles into Baghdad. Intelligence reports seemed confident that Hussein, his influential sons Uday and Qusay, and other regime leaders were in the same bunker at the same time and that the coalition knew where it was. The allies seized upon this opportunity to decapitate Saddam's regime with a single blow. The first Tomahawk missile to be fired into Iraq in the second Gulf War roared off from the San Diego-based cruiser Bunker Hill at 5.25am, March 20. Simultaneously, thirty-six Tomahawk Land Attack Missiles (TLAMs) hit the complex early in the morning on March 20. Unfortunately, later reports proved that the intelligence was faulty: Hussein and his sons were not in the bunker. Three other SUBPAC submarines, USS Louisville, USS Columbia, and USS Key West, also participated in the very successful strike mission responsible for the early successes of coalition forces. Coalition forces fired more than 725 Tomahawk cruise missiles by early 2003, one-third of the entire number in the inventory.